ATW 507 Where you tread (John Beavis) Beautiful and simple melody; one of those intuitive songs that most congregations will be able to sing immediately. Good for the whole congregation to sing or as a reflective piece. Highly recommended! AoV1-137 / ATOK 403 / GA306 / G(II)286 God Of Abraham lead us (Bernadette Farrell) I love this energetic call and response with the response "Lead us to your kingdom". Don't try to sing all 17 verses! Choose what you like... and "God of Ruth and Naomi" fits very well this week. You can sing with a cantor and response, or you could split your congregation in the middle doing half and half, or you could just have people singing all the way through. Lyrics (downloads a pdf). Good for kids. MV216 Wherever you may go (David Kai) A good song for the end of a worship service, with a commitment to stand by each other. The tune is pretty straightforward, but it will be worth introducing it to your congregation so they can be confident with it. The piano accompaniment is pretty straightforward. "Wherever you may go I will follow, and your people shall be my people too. Wherever you may go I will follow for I would be faithful, loyal and true". Lyrics. ATA 200 / CH530 / VU639 / A&M757 / CP(E) 548 / URW109 / StF476 One more step along the world I go (Sydney Carter) A good fun kid's song from Sydney Carter which many of their parents will remember. "And it's from the old I travel to the new, keep me travelling along with you". Lyrics and sheet music. Good for kids. *Seeds of Faith Do you know that I am your friend? / I’m Gonna Stick With You (Richard Bruxvoort-Colligan) This is a great simple song for kids about sticking with friends, which is hard to do sometimes when you're a kid. Probably the easiest way for kids to make sense of this reading.An excellent and fun song for kids. Lyrics and sound sample. Good for kids. Recorded music Ruth 1:16-17 (Justin Roberts) This is a beautiful song "Do not press me to leave you...". If you have a good singer and guitarist, they could present it to the congregation, or you could play the recorded song. CD includes lyrics and chords. God is great and cares for the widow, and brings justice etc. Cha766 Blessed are the poor and needy for God's justice surely is theirs Simple, very familiar sung response, and responsive reading. TiS 90 / AHB 44 / UMH60 / VU867 / GtG806 / PH253 / A&M673 / CP346 / CP(E) 473 / W&R79 / Cha20 / 82Hml-429 / StF079 / MP320 I'll praise my Maker while I've breath (Isaac Watts) A great classic hymn. Most sources are not inclusive; Voices United is! Lyrics and sheet music. Oldy-but-a-goody. *URW357 Praise to the One who sets prisoners free (Elise Eslinger) A great tune, and the response can be sung in three parts, or as a round. Can be sung with one or two cantors / readers or without the cantors. The refrain alone as a round could be good for kids. Online Resource Hear the message we now are proclaiming / El mensaje que hoy proclamamos (Eleazar Torregoza) This jubilant Colombian song of liberty and new life for the poor and suffering would fit well with this reading. Good for kids. Free sheet music! Psalm Project (2010) Hallelujah Hallelujah The god of Jacob (Richard Bruxvoort-Colligan) A nice way to present this Psalm to the congregation; this would work during the offering for our congregation, or have the congregation (including the kids) sing the Hallelujah bits as a Psalm refrain. Note to BUC: I have this! Sound sample and lyrics. G(3)093 I will praise the Lord all my days (Michael Joncas) A lovely Psalm refrain, very straightforward. The verses could be sung or read. Sound sample. TiS 702 / NCH768 / SFFS 2014 / GC257 / GC(II)263 / G(3)331 / PfAS146B / Lau539 Alleluia 7 (Taize) A very straightforward Alleluia that builds with energy. PfAS uses this as a refrain to a cantored (or read) version of Psalm 146. Sheet music and sound samples. WoV609 / GtG034 / SP&P055 / W&R735 / PfAS146B Hallelujah / Heleluyan (Muscogee / Charles Webb) Native American Hallelujah. I like it. It's simple and straightforward. It can also be used as a round (come in on each bar), and with a strong drum beat on 1 and 3. PfAS146 uses it as a refrain to Psalm 146. *PfAS146B Hallelujah / Puji Tuhan (Christian Tamaela) A simple Bahasa Indonesian Alleluia set as a Psalm refrain for Psalm 146. It will need to be taught. ATA 184 Spring follows winter (love is the law) (Robin Mann) Lovely words to a familiar traditional English (?) melody. There is a Father in the last verse, but is inclusive other than that. Lyrics. Particularly good for the Southern Hemisphere, where it is Spring. SP&P062 You shall love our God (Ruth Sandberg) An excellent round, which could be sung in unison, as a round, or in 4 parts. I really quite like this. I think this would be Good for kids. God Gives 1 Love the Lord your God with all your heart and all your soul and all your mind and love all humankind as you would love yourselves and (Unknown author)… I really like this old Sunday School round, with a groovy 50s feel to it. Lyrics and some mostly pretty bad Youtube videos. Great for kids. StS055 / SFFS 2168 / GtG062 Love the Lord Your God (Jim & Jean Strathdee) Very simple chorus. Good for kids. Iona (We walk his way) / G(3)517 / StF775 We walk his way / Ewe Thina (John Bell) A joyful, simple African song. I'm guessing it's from South Africa. Sound sample. Worldmaking.net O Holy One (Richard Bruxvoort-Colligan) A very simple song for the start of worship. It could be sung all together as a congregation or responsively. Sound sample and lyrics. Iona (We walk his way) / G(3)517 / StF775 We walk his way / Ewe Thina (John Bell) A joyful, simple South African song. Sound sample. Iona (WWHW) / MV223 We will go with God / Sizohamba naye (Traditional Swaziland) A simple song from Swaziland. Good for the end of the service. Video with pronunciation and parts. Note that MV has a different translation. Good for kids. NCH Psalter p701 (Elaine Kirkland) A very good arrangement of Psalm 119. The refrain is “Teach me, O God, the way of your statutes” and can be sung in 4 parts. Note that there are three sections. This week's reading is on p701. URW143 The Grace of God is like a road (Michael Hudson) Really beautiful words sung to a very familiar Celtic hymn tune (THE GIFT OF LOVE, which is very similar to O WALY WALY). Highly recommended. I would even print these words for the congregation to take home with them and meditate with during the week. A good song to sing after the sermon. We sang this once, three years ago when we read this passage. Would be good to sing it again. Lyrics. New words to old tunes. GtG064 I long for your commandments (Jean Janzen) Good words that pick up many of the themes of Psalm 119. You may like to introduce it this week, and sing it again in the weeks to come as we keep reading the Psalm. The tune is very old and quite lovely. 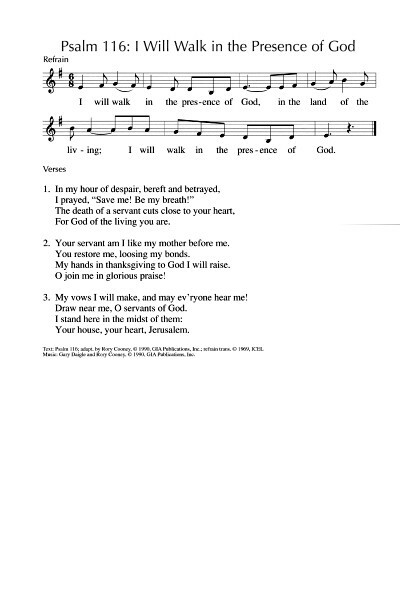 PfAS119G / PfAS199H O Lord my delight (Hal Hopson) Simple psalm refrain for verses 1-8. *MV108 I know your word (Simei Monteiro) A simple Brazilian rhythm and a catchy tune. Great for kids, and a good song for adults too. “I know your word, your word is a lamp to my feet O God. I know your word is a lamp, O God, to light my path forever”. Good for kids. TiS 430 / AHB 337 / Cha324 / StF164 Your words to me are life and health (George Currie Martin) I really like this old hymn. It’s a bit old fashioned, but it still works, I think. Lyrics and sheet music. Oldy-but-a-goody. AHB 341 A lamp for our feet has been given (Granton Douglas Hay). Solid words and a great old Welsh tune. I wouldn’t be desperate to sing this one, but if all you have is the AHB, it’s worth it. ATE246 / UMH601 / HPP256 / GtG458 / W&R664 / Cha326 / Cha759 Thy word is a lamp unto my feet (Michael W Smith / Amy Grant) Cha326 has this arranged as a simple chorus, and 759 as a sung response, and responsively read passage. Neither version has the verses, but really, the chorus is probably all you need. Video & longish introduction from Amy Grant, lacking her curly 80s hair. ATW 498 / Iona (T1AU) / MV 196 / SP&P182 / URW438 We will take what you offer (John Bell) An excellent simple short song that works well either as an upbeat chorus or as a reflective chant. "We will take what you offer. We will live by your word. We will love one another. And be fed by you Lord". Good for kids. Sound sample. GC109 I Will Walk in the Presence of God (Gary Daigle) A simple lilting refrain. Inclusive verses. This could maybe be used as a chant on its own. Sheet music & lyrics. Sound sample. TiS 71 / VU617 / HPSS362 / G(II)97 / GC108 I will walk in the presence of the Lord (Richard Proulx) A beautiful cantored Psalm. The refrain is very simple. Doesn’t make sense without the cantor. Christ's blood is better than that of goats and bulls. You may like to sing an Agnus Dei. *TiS 705 / Iona (Common Ground, EoA) / W&R282 / SP320 / StF234 / Lau610 Behold the Lamb of God who takes away the sin (John Bell) A simple Agnus Dei. Best if you can manage to get all four parts involved. *Worldmaking.net O Christ, Lamb of God (Richard Bruxvoort-Colligan) A more modern Agnus Dei, with Christ sharing our weakness. Lyrics and sound sample. NCH583 / GtG044 / StJ Like a mother who has borne us (Daniel Bechtel) This has very appropriate lyrics on God as mother and father, and God's presence when we follow by caring for neighbour. The tune is gentle, soothing and simple. Sound sample. Lyrics (scroll to the end of the sermon). *GC(II)604 / G(3)707 The Call Is Clear and Simple (Ruth Duck) Wonderful and realistic lyrics about what it means to love all humankind. Sung to a very familiar hymn tune (PASSION CHORALE aka O Sacred Head). A good response song for after the sermon. This one is really great. Lyrics. Sheet music. New words to old tunes. SP&P170 We share a hunger (Kirsten Warner) A simple song of unity in mission - hunger for justice in the world. *TiS 774 / GtG717 / W&R684 For the life that you have given (Carl P Daw) Excellent words for the offering. If your congregation, like ours, doesn't have a song to sing when the offering is presented, it would be good to try singing this for a couple of weeks. It's short and meaningful, and the tune is a quite straightforward hymn tune. Lyrics & sheet music. On the road Mystery of servant love (Ross Langmead) Excellent song, with much feeling about Christ's suffering, death, and servanthood, and our desire to live with the same depth of love for others. Sound sample.